RingLead raises the bar with Intelligent Forms Dashboard and real-time company alerts to deliver actionable, 360 contact and company views. RingLead, a industry leading data management provider protecting and enriching more than 300 million records worldwide, today announced the upcoming release of the industry’s most comprehensive and disruptive data enrichment platform to hit the market. Powering the second release, RingLead’s Intelligent Forms Dashboard has crowdsourced, compliant sales and marketing data at its core and feeds directly into RingLead’s full-stack SaaS platform, Data Management Solutions (DMS). Equipped with real-time company alerts for account-based selling and marketing, RingLead DMS Enrichment accelerates global innovation by enabling organizations to achieve faster revenue growth, reduce their costs, and access the technology, data and insight they need to be successful. “We’re committed to providing commercial and enterprise organizations tremendous business value by enabling them to manage their data in a much more effective way,” said Russ Artzt, Executive Chairman. RingLead DMS consolidates all core data management processes, from lead generation and data deduplication, to data protection and enrichment, into a single unified SaaS platform, enhancing the effectiveness of CRMs and Marketing Automation Systems like Salesforce, Marketo, SugarCRM, and Pardot. The addition of an Intelligent Forms Dashboard enables organizations to centralize the management of all form activity including form engagement, form submission, form abandonment, record enrichment, and overall form success. By centralizing all web form activity, sales and marketing executives can seamlessly and accurately score, route and segment leads. Equipped with sales and marketing intelligence alerts at the company level, DMS Enrichment helps business professionals stay up to date on their target accounts with real-time updates on relevant funding announcements, acquisitions, leadership changes, press coverage, and more. 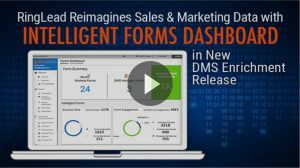 RingLead’s Intelligent Forms Dashboard is now live in DMS Enrichment.